Click the Proxy Settings command on the Options menu. Right-click the task tray icon and select the Proxy Settings command from the Options submenu. Click the Proxy Settings tab in the Options window after it has been displayed by using one of the other commands in the Options menu. 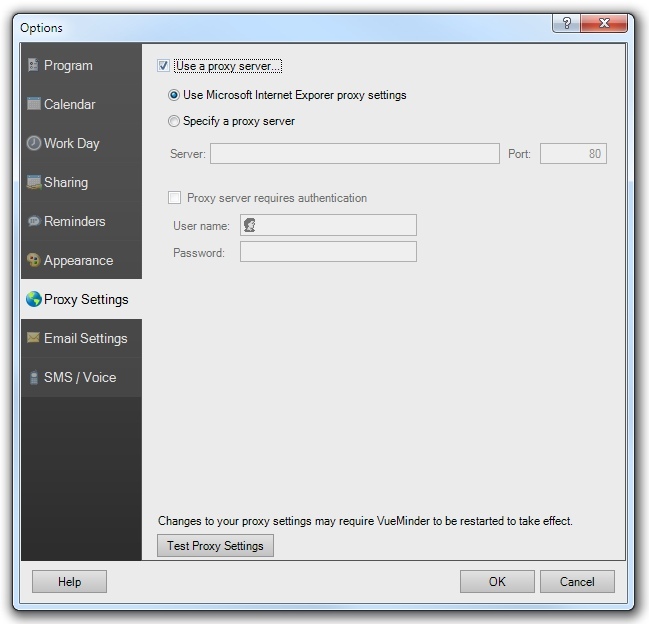 The Proxy Settings tab of the Options Window enables you to specify proxy settings, if required to access the internet. If you don't connect through a proxy server (or don't know what this means), then you can probably use the default setting, which is to not use a proxy server. If you connect to the internet through a proxy server, your proxy settings can be entered after checking the "Use a proxy server" box. If you don't connect through a proxy, you should leave this box unchecked to ensure VueMinder can correctly connect. VueMinder connects to the internet when checking for software updates, publishing or subscribing to online calendars, syncing with Google Calendar, sending meeting requests, and sending email, SMS, or voice reminders. After entering your proxy settings, it is recommended that you test your settings by using the "Text Proxy Settings" button. This will test your internet connectivity and report whether the proxy settings are correct.